There is not a more intense blue to be found than on the Greek islands in the Aegean Sea, and probably the best way to experience this beauty is by sailing the Cyclades from one island to another. 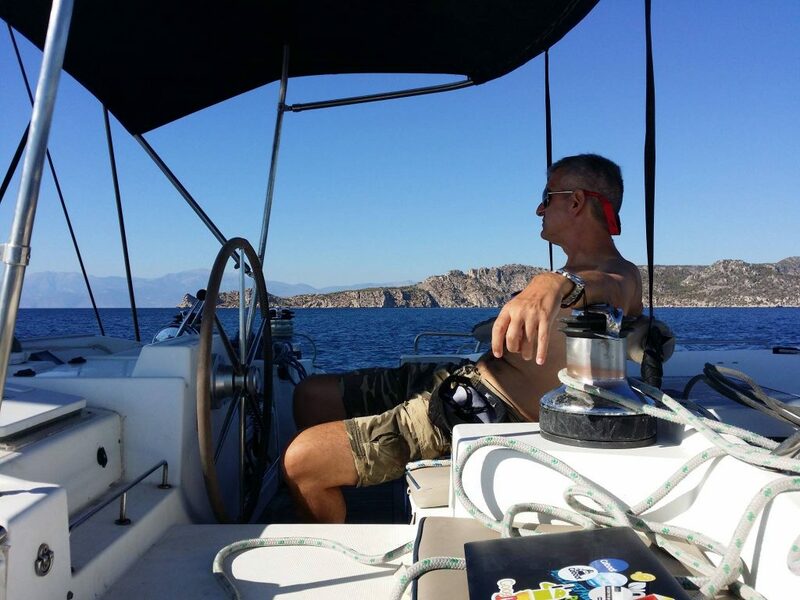 I was blessed to have the opportunity to do exactly this, last Summer, by joining Coboat, a co-working initiative on a sailing boat (a catamaran to be exact) during their pirate beta version in Greece. Sailing with Coboat has been high on my list for the last few months; I wanted to check out for myself if it would be a suitable place for a company retreat for a start-up. So, when this (last minute) opportunity to join this great initiative came up, I didn’t hesitate for a second and flew from Portugal to Greece, to board the Coboat catamaran in the harbour of Paros. With seven guests and three crew members we are on board with ten people in total. The crew consists of Marc the Captain, Becky the Community manager and Jacob the Cook. The guests are very diverse: there’s Craig, a very smart man who has been working in IT since the early days of email and internet and is currently employed by Google; his lovely wife Heather who works as a nurse; Ian, another nurse turned into nomadic singer-songwriter; Stella, a social entrepreneur who sells jewellery handmade by women in Uganda; Lucinda, a marketer who secretly dreams of selling elbow grease and rhubarb vodka; Sara, a developer and ex-start-up founder; Billy, who flies drones; and me, the Chief Happiness officer. Despite our diverse backgrounds we all have something in common: we are looking for new business- and networking opportunities, for new ideas and inspiration. And of course we want to have a good time, relax and enjoy the beautiful surroundings and the experience. Before boarding I was a bit worried; would the group be nice and how it would be to spend a week with complete strangers in such a small place? Luckily I already had two friends on board: I crossed the Atlantic Ocean back and forth with Stella on two digital nomad cruises and we met Ian on the second digital nomad cruise. The others however were all new to me. But it turned out I had nothing to worry about; both the crew and the other guest were the absolute best! Our days usually started with an early swim, yoga or sleeping in while Jacob prepared breakfast. After breakfast we would have some laptop time, while charging them as well (internet was really good but electricity is limited to the times the generator is on), or we would have a workshop or idea incubator. After lunch most of us would take some time to relax, read, have a nap or work a bit more. Usually the afternoons were our sailing time as well. The sailing could take up anything between 4-6 hours and the plans changed on a daily basis. As they say on Coboat: it all depends on the wind. During the afternoons I sometimes tried to get some more work done but if it was a bumpy ride I usually ended up sitting on the back of the boat looking at the horizon, the best way not to get seasick. At the end of they day we would arrive in the bay or harbour of the next island, where we would anchor for the night. That is the moment for a quick swim, after which we usually had aperitifs on the nets while enjoying the sun, talk or do another idea incubator. Later in the evening we would have dinner; either on board or we would go on land to have a nice Greek dinner in a local restaurant, after which we would go back on board for socialising and enjoying some Greek wine. 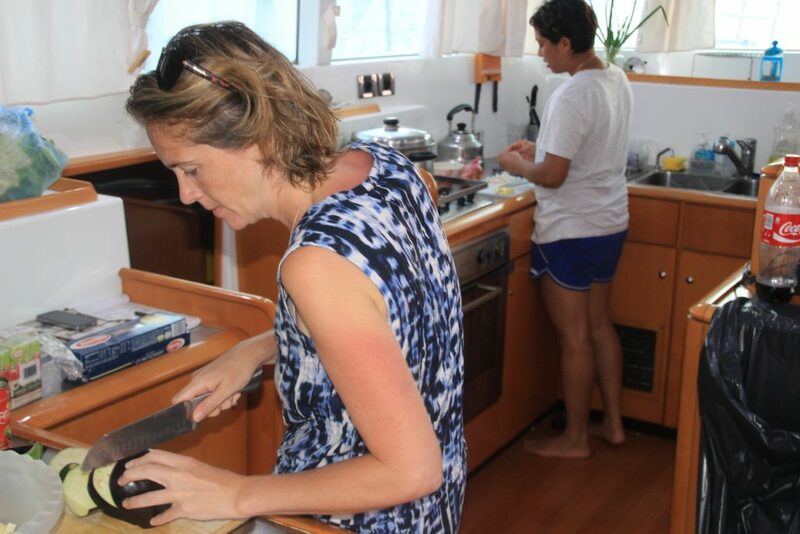 During this week on Coboat, we talked, we worked, we ate together, and we laughed together. We bonded and we build such strong connections, and we had so much fun! It was just amazing, and in just a week we became our own co-boat family. Would Coboat be good for a company retreat? Absolutely, it would such a good opportunity to build strong connections and to strengthen your team. You are working and living together in a small space, and there is an opportunity to learn about sailing that will help you with your team building even more. 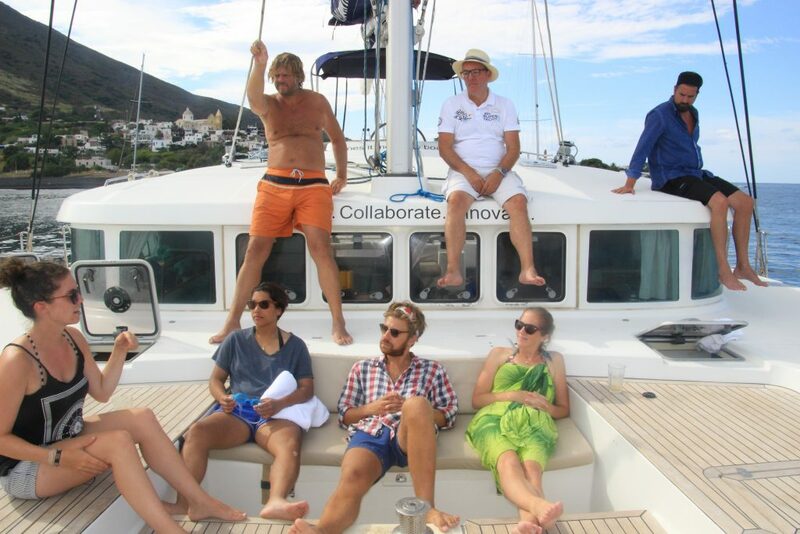 If we, a diverse group with almost no previous connections, were already bonding so strongly, imagine what a week on Coboat would do for connecting your start-up team! A yearly company retreat is a must for any (remote working) start-up. You do need it to build your culture and strengthen your team. Click here to download the full checklist with the 21 elements that build successful start-ups. I would recommend co-boat for a company retreat combined with a focus on team building and / or strategy planning. For example, I did my connection workshop with this group and by actually focussing on building better connections it adds even more value to the whole experience. Do keep in mind though that actual laptop time could be limited, both because of the sailing, the electricity and the fact that you want to enjoy the company and the experience. However, there is always the possibility to adjust the itinerary and spend a day on land in a co-working space or in a restaurant with good wifi if you want some productivity time included. If you want to know more what I can do for you in terms of your company retreat please contact me. Thank you all guys. Coboat founders Gerald and Karsten for having us. Jacob, for feeding us with your tasty food. Becky, for being my roomie and connecting us. Billy, for the amazing footage. Stella, for just being you and for the photographs. Lucinda, for the chocolate and inspiration, Sara, for the laughs and Ian, for the music. Of course special thanks for Craig and Heather, not only for the wine and the octopus, but for taking such good care of us. Originally published at pinqconsult.com on October 6, 2016. 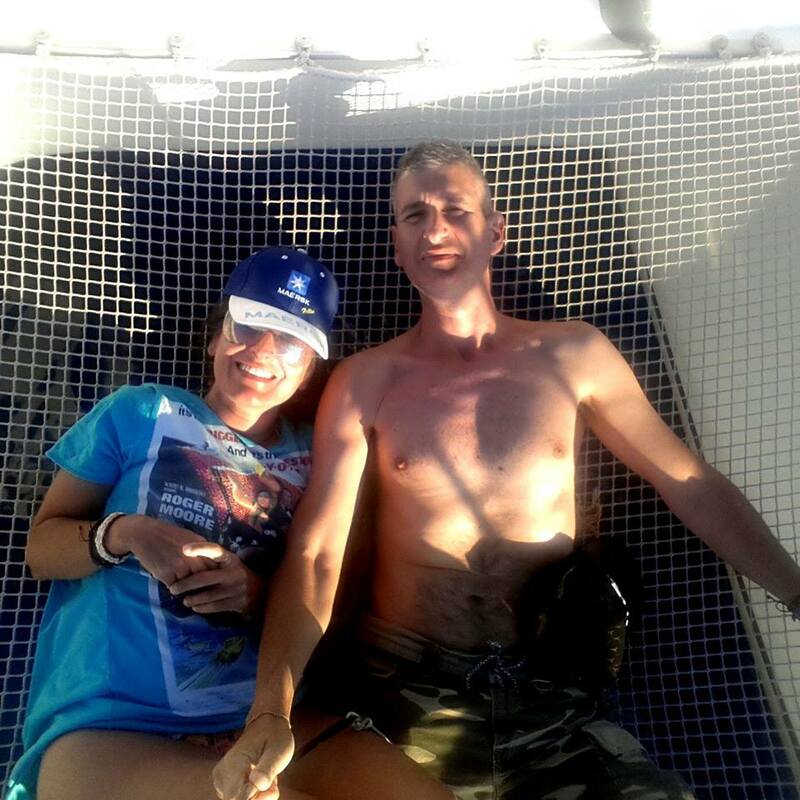 This week two very special guests joined us on Coboat – Kirsty and Avalon from Coworkation! As their mission is very similar to Coboat’s, the week was bound to be full of mission and marketing discussions. Exploring Milazzo on Saturday, we found a very nice restaurant on top of the town and immediately started the discussions. Emma, one of the crew member from last week, decided to stay for another night to exchange views with the new guests on definitions and found the one that fits her best – semi-location independent! Setting off on Sunday back to Vulcano, the new crew members settled into boat life and introduction rounds already led to a very lively discussion about personal and professional challenges. One of the first sessions throughout the week was our very own chef Jacob’s, who will be launching his eye care software Blynk on the 21st of September from Coboat! This week saw him getting some last feedback and updates before the big day. This week, he also downloaded the software ready to launch so the crew could get a first look at the finished product. On Wednesday, the Coboat crew took their own advice and took a step back to look at the bigger picture of Coboat to evaluate and re-establish vision and strategy together with Kirsty and Avalon. Topic of conversation was mission drift and how to avoid it during the start up years. It proved to be a very productive, thought provoking few workshops resulting in a number of actions to progress. Exploring more of the Lipari islands before finally heading to Palermo, Coboat sailed to Panarea, Salera and Filicudi for more beautiful sunsets, swimming and sailing. One definite highlight was the tuna in Filicudi – a must have to all those travelling in the area. Thank you to all the crew on board this week and we all hope to see you again soon! I recently wrote about my experience of the coworking / coliving movement and have set out to gain further input into this topic. To explore the impact of the coworking and coliving movement I spoke with Eleni Atsikbasis, Founder of Digital Nomads Lesvos, Birds Bay Coliving Space and instigator of the Healing Lesvos Programme. Digital Nomads Lesvos and Birds Bay are new coworking and coliving spaces on Lesvos and opened in May 2016. It forms part of a strategy to bring a new form of tourism to the island. It is a project within a bigger programme called Healing Lesvos, initiated to rebuild and re-balance the island after it was hit by the refugee / migrant crisis last year. What is your experience of the coworking movement? I am the founder of the coworking space Digital Nomads Lesvos (DNL) and the coliving space Birds Bay. This year I have also spent time on Coboat and although fairly new to this movement, I already see it’s potential to change the world. Why do you think people are choosing this working life over ‘normal’ or, traditional jobs? Turning up to the same desk, same office and seeing the same people limits productivity, growth, our sense of belonging and our experience of the world. People are beginning to experience that travel breeds creativity and by creating a lifestyle born out of more worldly experiences is a source of inspiration that sparks solutions. Of course this is all made feasible through the rise of technology. It is now possible to work from anywhere. However it is not always a choice. For example I believe some digital nomads are refugees of capitalism. Most aspiring entrepreneurs and changemakers in the west are unable to progress in their home country as they can’t sustain themselves financially. Many are leaving their home towns for the East or more affordable locations where costs of living are much lower. What are the benefits of this movement? “Nomos” is Greek for pasture. A nomad moves from pasture to pasture.’ (Bruce Chatwin, The Songlines, Vintage, 1998 p16). I am seeing a huge social impact. The movement connects people to the world and, our universal problems. We have a lot more to gain by supporting this movement and I believe it is crucial to solving some of the world’s biggest challenges. The more people move around and experience other cultures the more we connect with nature, people and places. Thus, creating interconnected selves which essentially results in more socially driven actions and decision making. These social entrepreneurs are engaged in helping others and are much happier and healthier for it. DNL and Birds Bay was visited by Coboat and their community this summer and after spending time in our coworking space and learning about the challenges facing Lesvos the entrepreneurs on board immediately engaged with me. I am now collaborating with three members of the Coboat community which is just what the island, Lesvos needs. The movement also has the potential to have a positive impact on our younger generations, essentially many of the future leaders of this world. At a young age we have such drive and risk taking spirit (the same mentality as an entrepreneur) which is sadly often lost post adolescence. By encouraging and supporting young people to consider this new way of living and working I am sure we will find they as well as, many adults will maintain this drive. Coworking could help shape young people to engage with the world’s problems and find creative solutions. This year we are initiating the Lesvos1000 project of collabration born out of connections I made on Coboat. The project invites 1000 students from universities all over the world to take part in a living lab on Lesvos, set up to rebuild and rebalance the island after last year’s traumatic refugee/migrant crisis. By engaging the students through first hand experience, I hope to not only educate them but to spark their creative minds and it lead to more socially conscious ideas and decision making. 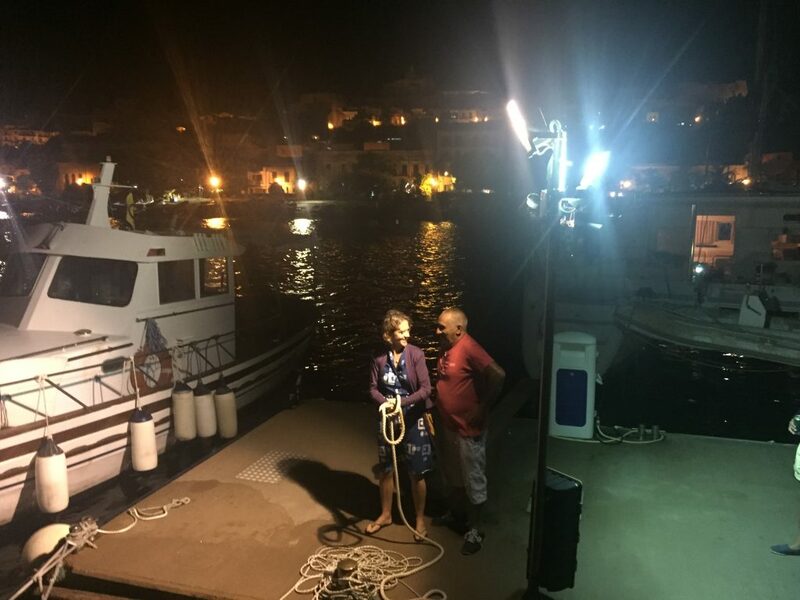 Eleni talks to Coboaters about her mission to heal Lesvos and as a result strikes up a partnership with Craig Warner, who initiated and is now leading the Lesvos1000 project. How can we better support and contribute to the growth of this movement? I’d like to see the introduction of entrepreneur visas (EV) to remove the barriers of traveling for remote workers and similar communities. Visa situations can be prohibitive and often present grey areas of what’s allowed when working for yourself or another company unrelated to the country you are staying in. There are such things as business visas which are being trialled in Barcelona and Portugal but you need to be earning a certain amount of money, tick specific criteria and, be able to prove you can sustain yourself. So although a step in the right direction, it excludes many who work remotely. We should remember that by spending time in different places we are contributing to the local economy. The Entrepreneur Visa would have to be applied for in the spirit of supporting the location you’re in. It has to go hand in hand. The benefits are the transfer of knowledge and the kickstarting of social start ups. For change and growth to happen, particularly in locations that are in most need, I believe it is imperative we expand the way we define our ‘selves’ and for this to work, we should think about how we can act to support the the younger generations who have so much energy to brainstorm/act/do (inherently part of who they are) to travel and work within such communities. It’s with the support of ‘elders’ that our youth may achieve ways of doing things that we adults have limited in traditional work environments. Just after interviewing Eleni and whilst writing up this article Barack Obama announced the creation of start up visas to encourage entrepreneurs to start companies in the US. What future do you envision and what’s needed to make it possible? Now that Obama has introduced the start up visa I would very much like the concept to be adopted worldwide. Let’s start with Lesvos, Greece where renewal, rebalance and economic growth is imperative to help offset the recent trauma and, let’s migrate this model step-by-step globally. I would also like to see more corporates facilitating location independence for their employees. Instead of being frightened by it, embrace it and see it is an opportunity to improve productivity and creativity within their organisation. Employees should be encouraged out of their comfort zone much more often. The more we travel the more we will reconnect with our world and our identity grows. We all share the same water and air and I believe we need to find a new ‘universally integrated’ identity to face these crucial times and not be fearful of them. I would like to see the majority of our young adults working together in different communities to solve collective challenges. This is why the EV is good because parts of the world can benefit from knowledge and skills they wouldn’t have access to normally, and therefore maximise the chance of solving problems. Be there, experience it, talk to the locals and implement new collaborations. I am in awe of individuals who against all the odds achieve great things and by doing so they serve to educate, change perspectives and make the world a better place. I believe platforms such as TED are extremely important for inspiring action and putting some great role models on the world’s stage. One of my favourite talks is Drew Dudley’s Everyday Leadership where ‘Lollipop Moments’ are emphasised as important acts, which no matter how small, could positively impact another person’s life and even change it’s course. It has made me question how we can encourage people from being passively empathetic to taking action. Imagine what we could achieve if we came together? What I truly believe the world needs is global communities to overcome some of the challenges facing our world. These days, to me, it seems communities, in the traditional sense, are dying out. Neighbourhoods, villages and towns are more disconnected than ever. The rise of individualism has resulted in failing societies and fewer communities. Perhaps we would be willing to better understand and support one another if we realised just how connected we are. Hats off to Momondo for their DNA campaign. What an eye opening exercise and a powerful catalyst for changing people’s perspectives. I chatted about this recently with Christian Zirnig, friend and coach. He made a point that resonated with the experiences I was having and observations I was making. He reminded me that people will act when united by a common goal or mindset with others. And he’s right. I spent time this year, away from my home in the UK and meeting many people from all over the world because I was acutely aware I have a very British view of the world. In the words of Chimamanda Adichie, “The Danger of the Single Story”, it is not that this view is untrue. It is incomplete. What I found was the coworking and coliving movement which is transforming the world of work. It has created a collaborative global community and the spirit of the movement is inspiring action. Coworking is the gathering of a group of people to work together but not for the same company, instead of working remotely in separate offices or from home. It suits independent professionals, telecommuters and others who work from anywhere allowing them to come together in one space. Coliving is the new movement and takes this one step further, offering living accommodation alongside a place to work. Coworking and coliving and the changing nature of work sees a new community emerging. I believe this shift away from traditional working practices will prove to be an important one and will positively impact the world in which we live. Amarit Charoenphan, startup ecosystem builder, serial events organiser and entrepreneur passionately believes that coworking can change the world.“Coworking spaces are the communities that bring the cooperative and collaborative cultures back to our cities, our communities, our society”. My experience of coworking and coliving started with Coboat and through this groundbreaking project I have met an array of people from all over the world. Coboat is a coworking space on a Catamaran. Everyone on board, every week, upheld the coworking core values as outlined by the coworking manifesto, ‘community, learning, collaboration and sustainability.’ And they had this in abundance. The support and offers of help were always given with such energy and enthusiasm that it became addictive. My experience has been no different. 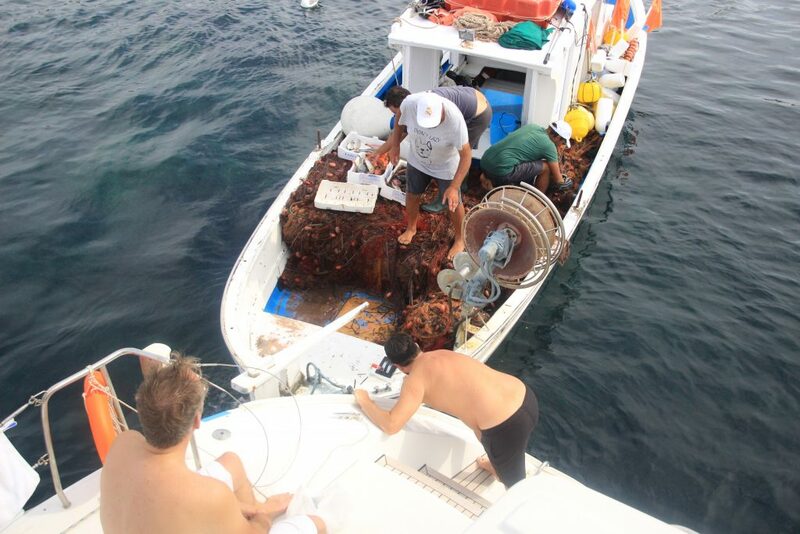 Every week on board Coboat people connected, shared ideas, challenges and everyone pitched in to support and help. It is a form of collaboration I had not experienced before. This collaborative spirit was highlighted in an article by Economia which explained that 84% of Impact Hub Westminster’s members have collaborated with other co-workers, be that finding someone who’ll design a website for them, helping them with their marketing, or going into business with them. (Impact Hub is an innovation lab, business incubator and a global network of social enterprise community centres with more than 15,000 members). At the core of the movement is a socially conscious mindset, something that’s cultivated by travel and a connection to nature, places and people. This connection and experience essentially results in more socially driven actions and decision making. If you haven’t heard of the programme Healing Lesvos you soon will. You may remember Lesvos as the Greek island most hit by the migrant crisis in 2015. A year on and the island is crippling from the impact of the influx of migrants. Eleni Astikabasis, local business owner, is driving a programme to re-build the island and sees huge opportunities to redesign life on Lesvos. The coworking/coliving movement is a key component of the plan. Digital Nomads Lesvos (DNL) is based out of Bird’s Bay in a beautiful setting on the island. Eleni’s vision is to host digital nomads and location independents on the island thereby bringing in an alternative form of tourism. As well as boosting local economy DNL will connect the coworking community to the challenges of the island, and by tapping into the skills of the members will drive global collaboration for the Healing Lesvos programme. 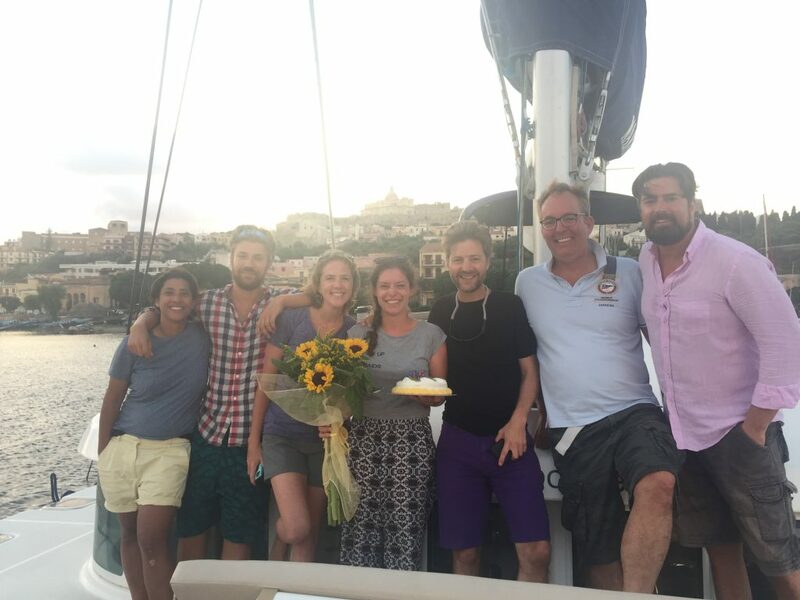 One of the most exciting outcomes from Coboat’s first five weeks sailing is the ongoing collaboration between Eleni and three guests she met onboard. 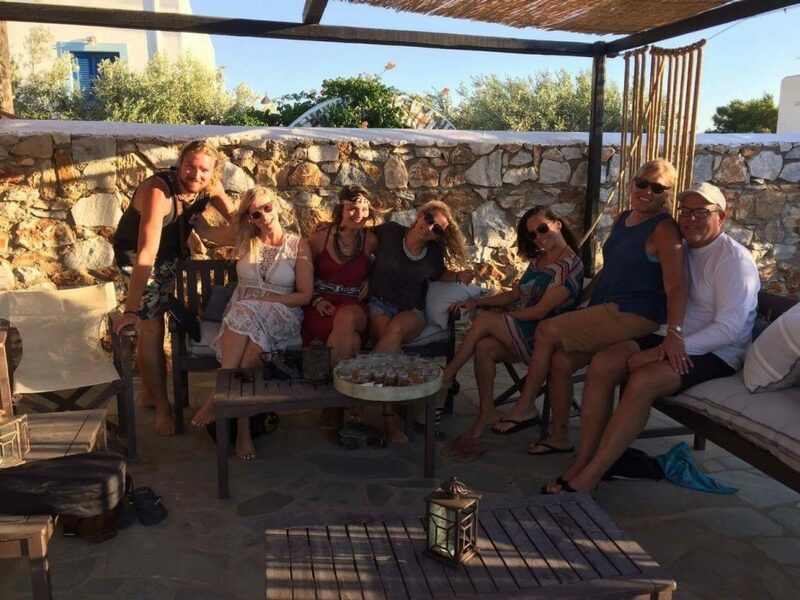 Each guest has offered skills and connections to support Eleni’s mission, including marketing skills and connections to universities in the US which has resulted in the birth of the Lesvos1000 project. The project invites 1000 students from universities all over the world to take part in a living lab on Lesvos, set up to rebuild and rebalance the island. True to form, the coworking community has come together to collaborate on a socially founded project. To have been part of this, and seen these collaborations form, has opened my eyes. I see now, more than ever, the importance of growing this movement. Changing the way we work will change the way we interact with the world and each other. 2) Coworking/coliving establishes global communities, binding connections, breeding collaboration, social engagement and action. The future of work is becoming a popular topic to write about and for good reason. According to a recent survey, coworking spaces have grown by 36% in the last twelve months, which puts the number of coworking spaces worldwide at around 7,800. Today, about half a million people are working in coworking spaces. These numbers are set to rise. But what is the potential and other impacts of this movement? My observations and experiences are in their infancy so to gain a deeper understanding I will be exploring this topic further by speaking with leaders and members of this movement. Coming up is an interview with Eleni Astikabasis about the social impact and potential of coworking / coliving. Jacob Kowalewski who, in between cooking delicious meals on Coboat, developed his idea Blynk whilst sailing the seven seas. On the 21st September 2016, the eve of his 25th birthday, he will launch a free eye care software as a platform for raising money for eye care in the third world. The software itself encourages you to maintain a healthy blink rate when your eyes are engaged with a screen. Blinking is the single most important thing when it comes to keeping your eyes healthy, but studies show that when your eyes are engaged with a screen you can blink up to 66% less than you normally would. It’s probably happening right now. 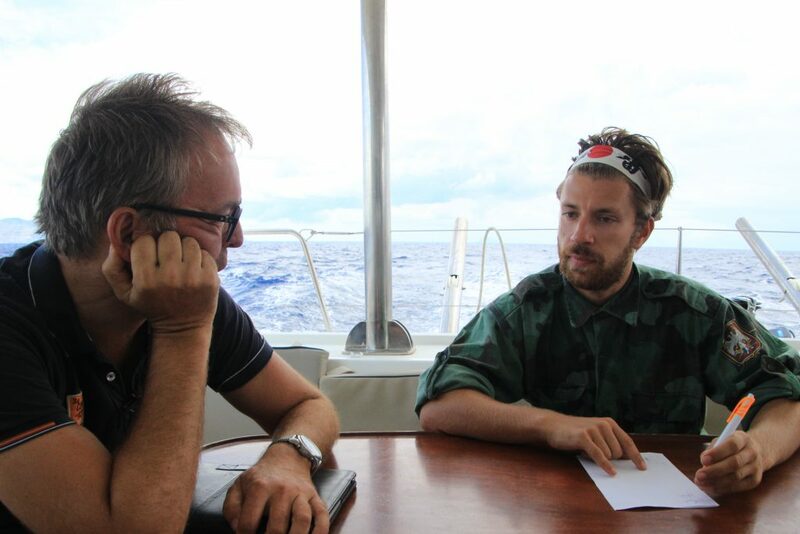 Jacob has benefitted from a hugely varied talent pool on board to help him. Catherine, (who has her own inspiring Coboat story, coming soon!) spent three weeks on board. With a background in development she worked with Jacob during and after her time on Coboat to build his website and refine the software itself. Lucinda Gosling, expert in marketing offered her skills and experience whilst on board to promote Blynk and connected Jacob with a brand expert to rebrand Blynk. September 2016 sees Jacob hit a major milestone in his project as he prepares to launch. Ten weeks spent on Coboat, countless idea pitches, his pitch fully honed and perfected and feedback gained from his target market and it’s time to start telling the world. To help him spread the word about his launch Jacob is using Thunderclap. Thunderclap is the first crowd-speaking platform that helps people be heard by saying something together. 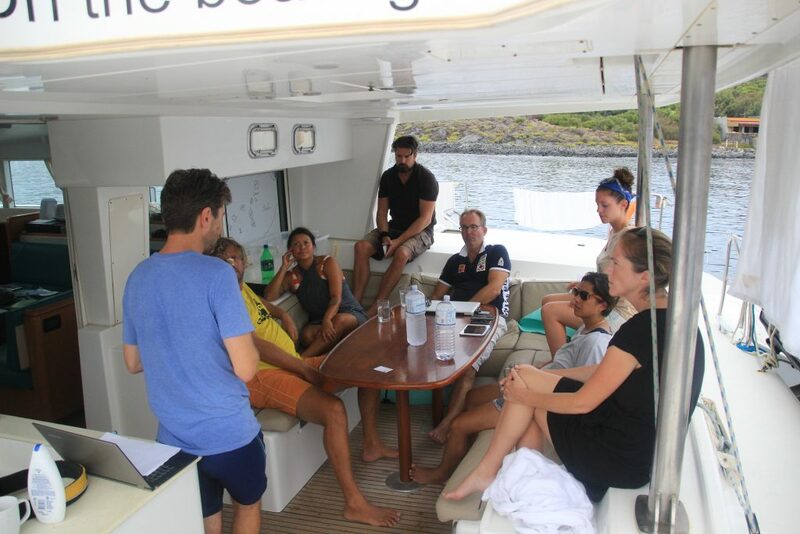 Last week, on the nets of the Catamaran, whilst sailing from Vulcano to Panarea in Italy, Jacob gave his last pre-launch pitch to the Coboat community and concluded with an invitation for the guests on board to spread the mission of Blynk. And we did. Blynk started Thunderclapping. The Coboat community, friends and family helped Jacob achieve a reach of over 38,000 people in the first few days. Jacob is also talking to major eye care providers to help him raise awareness of his software and mission. With six days to go until the official launch we anticipate that Blynk will be seen and shared across the globe. Jacob you are our second ‘Made on Coboat’ success. Huge congratulations to you and it’s been a privilege to have been part of your journey. Our message to you reading this story – get on board Coboat, explore, collaborate, innovate and start Blynking! Reduced blinking can result in: dry eyes, tiredness, blurred vision, lower productivity, uncomfortable contact lenses, difficulty reading, stinging eyes, low quality sleep and CVS (computer vision syndrome). Blynk converts your mouse or caret into a smart desktop icon that helps you to maintain a healthy blink rate. It is also easy to forget that your eyes, just like your muscles, can be overstrained and need breaks too. Blynk will also remind you when your eyes might appreciate a little break from your screen. Both of these features are fully customisable to your schedule and needs. The software is completely free and supports a fantastic charitable cause. Through a combination of partnerships with one of the largest eye care charities in the world, and very high profile optometrists he hopes to raise money as a means of eliminating inadequate eye care as an obstacle to breaking out of the poverty cycle. 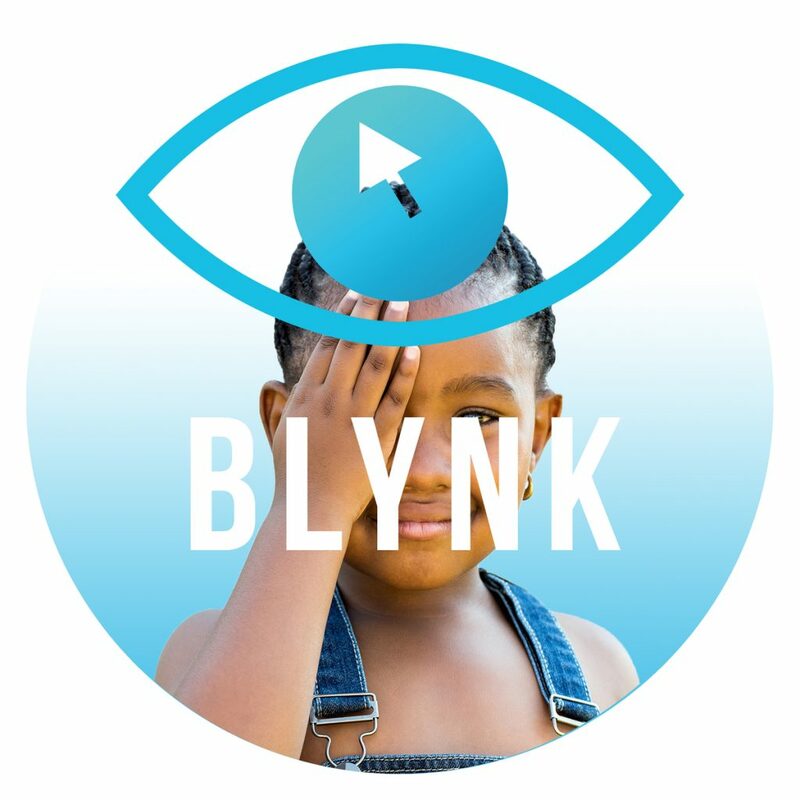 Blink more, improve your health & help fund third world eye care. ‘Blynk’ here. Support the Thunderclap campaign here. This week started off in Reggio di Calabria. 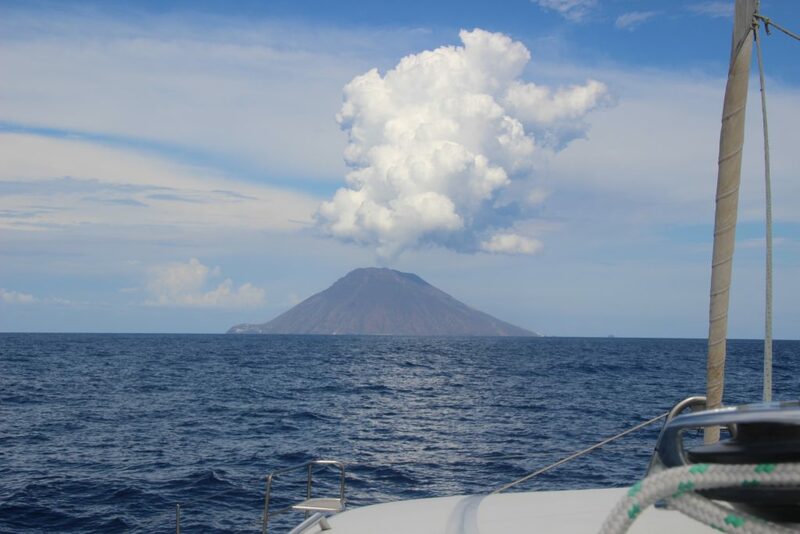 Eager to leave as quickly as possible, Coboat set off back to the Lipari islands for some more island hopping, volcanoes and crazy adventures. One of the most discussed topics included the definitions surrounding ‘location independent’ and ‘remote worker’ in an effort to define Emma’s lifestyle. In one of the many sessions, the crew discussed the life and challenges of being a digital remote worker/location independent and surrounding topics such as finding a community, how to deal with friends and family at home, and many more. Stromboli again provided us with the best entertainment (after last week’s excursion up the volcano) when we met Logan, a former Coboater, who is currently performing on the island with his circus at the Festa del Fuego. An adventurous dinghy ride back to the catamaran in the rain with lots of lightning and thunder was a great rounding off to an eventful night. In yet another idea slapping & pitching session, two new ideas for blogs were pitched and discussed and will be followed up on in the upcoming weeks to become reality. Further sessions included a concretisation of Stefan’s ideas, a guide to Facebook maarketing and Jacob’s presentation of his project which will launch very soon! Our Chef Jacob shares details of an idea he has been developing whilst on board as he prepares to launch later this month. So exciting! As Friday was Helena’s 25th birthday, the entire crew got together to sing and take some incredible pictures with the sunset in Milazzo. Celebrations continued into the late hours of the night and it’s safe to say that it’s been an unforgettable night. We were all sad to say goodbye to this week’s crew members and hope to see them again on the boat soon! Any of you long term remote workers miss being part of a community? 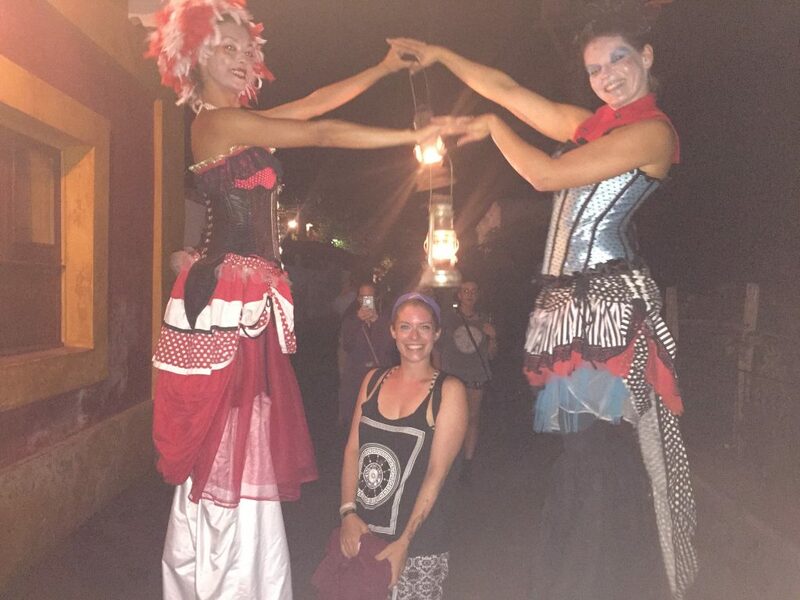 Here Emma shares her learning’s and awesome outcomes from her week on board. Journalist | Travel, food & lifestyle writer, www.greecessence.com | Full article can be found here. 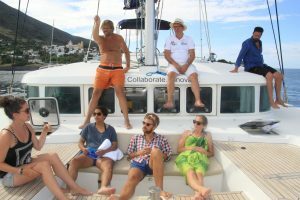 When I happened upon the innovative Coboat concept a few months ago, reading about the founders’ vision to create their dream coworking catamaran, it nabbed my attention – hook, line and sinker. So, when I caught wind of the fact that the Coboat crew was heading to the Mediterranean to launch a trial run commencing in Greece, I knew we had to get onboard. We were curious to find out what it’s actually like to co-live, co-work and play on a boat for week as it sails from destination to destination. The aim is to draw creative inspiration from the endless blue, discuss ideas, deliver pitches and receive feedback and network in a relaxed environment, all the while remaining in touch with clients, colleagues and collaborators via a speedy internet connection. 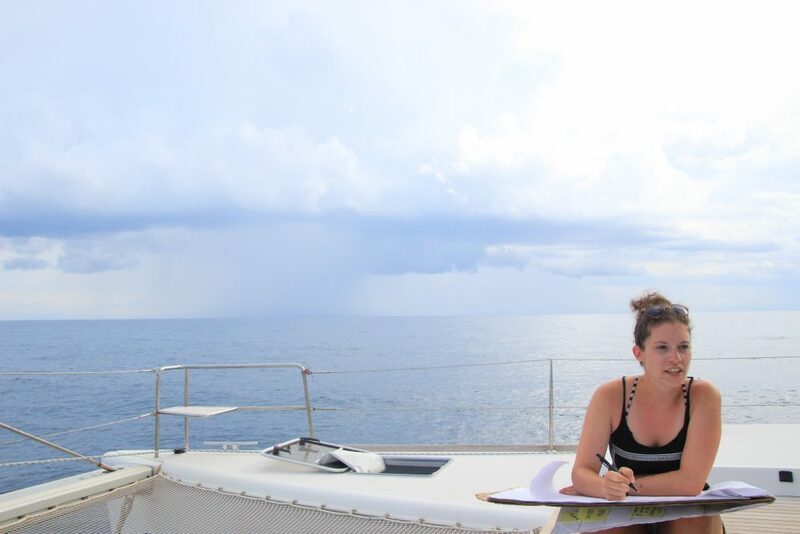 The fact that the space is a catamaran makes it a unique remote working experience that sets itself apart from the coworking retreats, projects and “workations” that have sprung up in buzzing cities like Barcelona and exotic locales like Ubud. Carlo and I are salty dogs to the core, so we knew that we would be in our element on Coboat. We’ve been meddling about in motor boats and yachts, surf skis and kayaks, rafts and canoes, and anything else that floats since we were months old. Carlo grew up boating on the White Nile, diving the Red Sea and sailing off Italy and Greece. I was born on a big island – Australia – to parents who hail from the tiny isle of Agios Efstratios, a rocky speck in Greece’s northeast Aegean. All my life, I’ve lived near the sea, and can’t fathom what it’s like not to be able to run down to the beach whenever I want. Saltwater courses through our veins, so we feel most exhilarated when we’re in or on the sea. Perhaps, the ebb and flow of the sea prompts flexibility in our thought patterns, impacting us in ways that researchers are only just starting to investigate. Researchers like marine biologist Wallace J. Nichols, author of New York Times best-seller Blue Mind, have found that simply looking at the sea and horizon – this binary beauty of nature – can help us blow away the brain fog. Bodies of water stimulate fresh neural connections, which may help us to view a situation from a different perspective. This question was posed to us on social media. Sure, there are fun and games, and swimming often involves a ride on Uni. In fact, Uni played an instrumental role in a covert Coboat mission involving Coboat stickers and a mega-yacht off the Ionian isle of Ithaca. For most Coboaters, work was not only possible but necessary, though not in the way you might conduct it in your office at work or at home, or even in a regular co-working space. If you’re thinking that you’re going to whip out your laptop and sit in a corner to work on your own for hours at a time, you’re missing the whole point of Coboat. You will be able to log onto your laptop and work in peace, particularly during long stretches of sailing to the next stop, and when seas are calm. This is an opportune time to make notes about your experience, email or Skype a client, or prepare your presentation to fellow Coboaters. But the point is to remove you from your normal working space to a space where you may feel as if there are no limits to your imagination. A place where you might feel you can make brave decisions that you wouldn’t make on land, perhaps in the rigid environment and mindset of an office. The aim is for you to experience a new environment with new people. To help your mind foster new ideas and disrupt your mind space, but also switch off completely and contemplate in peace.